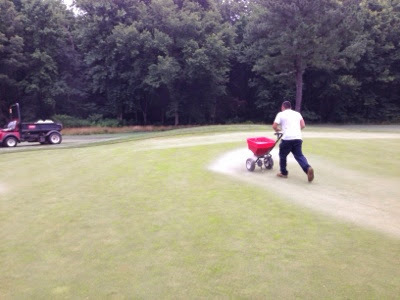 During the summer months we switch from our medium rate topdressing to a lighter topdessing program. The lighter rate allows us to apply it with push spreaders verses using the bigger pull behind unit. The lighter rate, along with less traffic is one more step to reduce stress to the bentgrass greens during the summer times. The benefit of the sand is that it allows for a firmer playing surface, aids with drainage and air flow around the crown of the plant, along with thatch reduction. The greens receive approximately 350 lbs of sand per green. This is performed weekly until the first week of September. As you can see in this picture we instruct our staff to stay off of the bentgrass collars with the sand. The collars take more abuse through out the summer which can lead to decline. 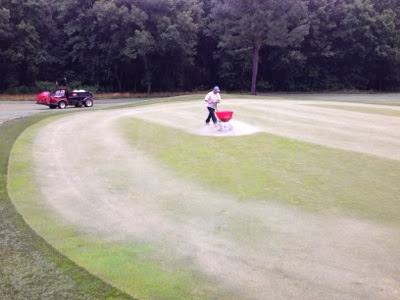 We have found that not applying sand during the summer has helped with managing the collars in the heat.